Jersey supports multiple Application classes to be registered, on the other side currently RESTEasy doesn’t support multiple Application classes deployment yet. In this article I’d like to give a brief introduction on Jersey implementation and compare it with RESTEasy current design. // create a new servlet container for a given app. 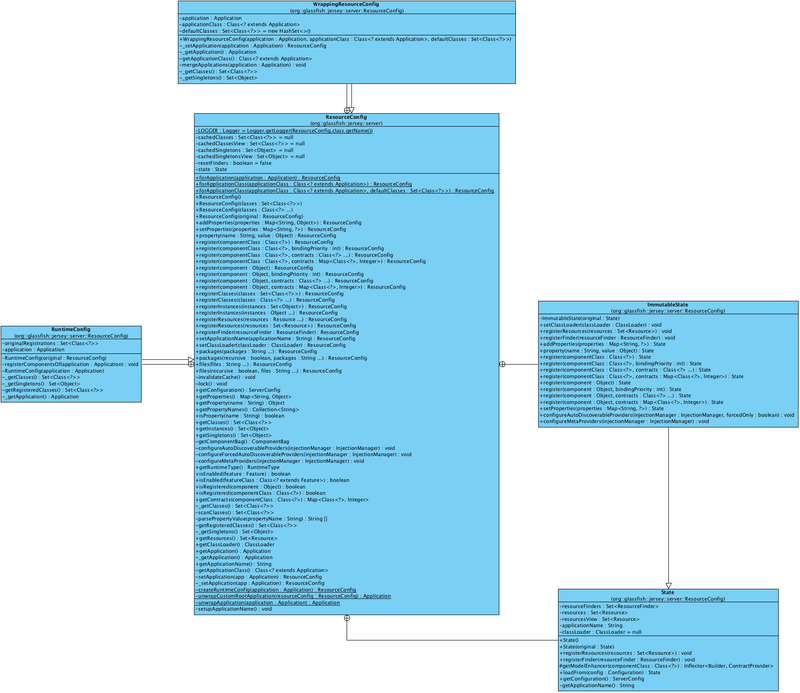 From the above diagram, we can see WrappingResourceConfig contains application : javax.ws.rs.core.Application and defaultClasses : java.util.Set<Class<?>> = new HashSet<>(), this provides the application -> resources mapping. If RESTEasy wants to support multiple Application deployment, it also needs to have a data structure to record the relationship between each Application instance and its included resources. Please note Application is just a method to help users to register their resteful resources easier in Servlet container, both Jersey and RESTEasy core design don’t merely rely on the Application to find and register resources, and other non-servet containers just don’t need Application to register resources. You can refer to RESTEasy’s Netty container document3 to see how it register resource classes via programmable interfaces.